Had a successful painting in the morning. After lunch, I drove around and found this spot. A street with a good subject, plenty of shade, and the street was closed to traffic due to construction at the end of the block. It went fine except for the occasional construction vehicle which l rambled down the street. I had to make some adjustments due to the shifts in light which occurred over the two hours which I worked on this painting. 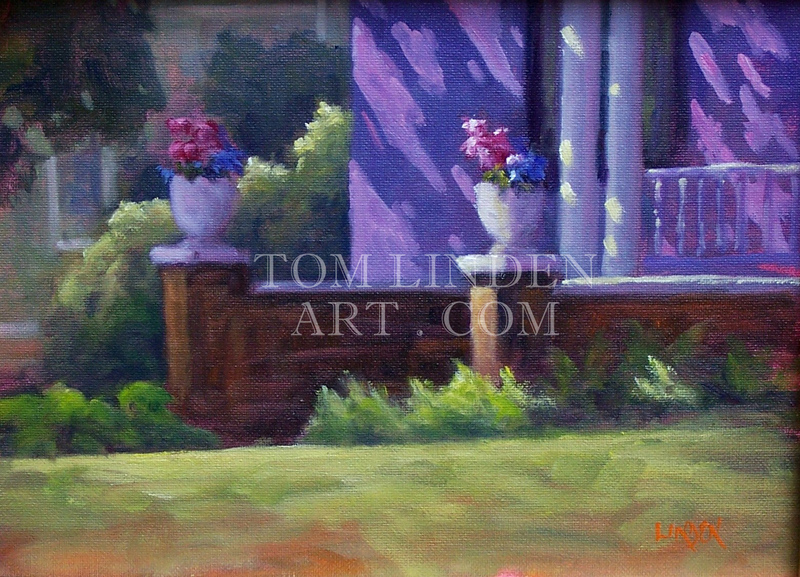 I also had to compromise the foreground of the painting, rather, I used artistic license to indicate grass rather than the plants which covered this yard. 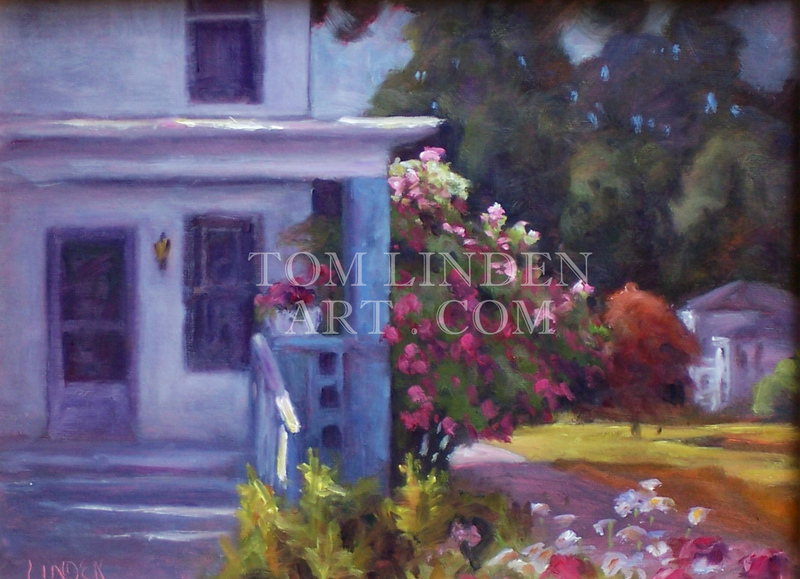 During a quick drive around town the previous day, I noticed this porch and flower baskets. I had a hunch that the early morning light could yield an exciting display. The hunch paid off. I quickly set up my gear and got to painting. Soon into painting, I was interrupted by a mother and her three young boys. The woman apologized but she and the boys were curious. We chatted for a few minutes and they left. The boys thanked me and wished me luck. Very polite young men. About an hour later, the family was back. Again mom apologized and said that the boys were driving her nuts because they wanted to come back and see how the painting was progressing. Not a problem as they were still as nice and polite as an artist could want to encounter. Finished the work, packed up and made my way to a park to eat lunch and decide the next move. It was “one of those days”. 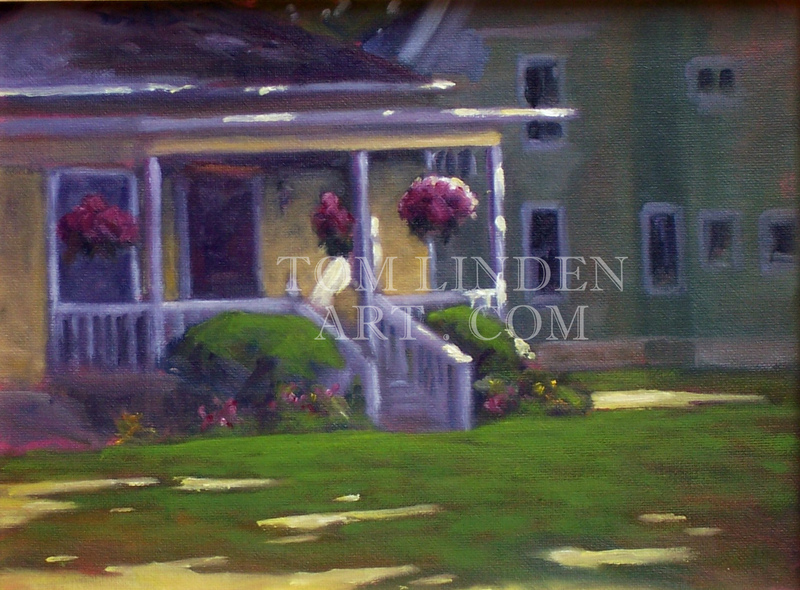 The Beloit plein air competition had their show and sale over the weekend. The art work was to be picked up on Sunday. I was out of town for my sons wedding. The head of the Beloit committee had instructed me to meet her in Beloit Monday around 9:00am to retrieve my paintings, but call her cell phone first. I called her around 8:15am. She was startled, and told me that she was on her way out the door for a doctors appointment. I was puzzled. She said that she had forgotten about the doctors appointment when I was given the instructions. I then I had to haggle to make arrangements to get the works later on Monday. I was told 1:30 – 2:00 pm would be the best option. I was hoping to retrieve my works on the way up to the Evansville plein air competition (about 20 miles away) so that I could spend a full day in Evansville. Okay. Adjust. Get up to Evansville. Get some canvases stamped, work a small painting, get back to Beloit early afternoon. Not so fast. Arrived in Evansville about 9:45am. The shop that would stamp the canvases (a must for any paintings in this competition) does not open until 10:00am…except Mondays when they are closed. WHAT??? Quick read through the instructions again. It mentions that the shop will be opened every day for the event. I found a phone number and gave a call. No answer. I left a voice mail and pondered my next move. This day was not proceeding according to my plans. A couple minutes later, my cell phone rang. One of the event organizers returned my call. He was sorry that the shop was not open as he was on his way up to Madison to take his daughter for a doctors appointment. The man said that he would call his wife and have her come over to open up the shop and stamp my canvases. She should be over in about five minutes. It’s now about 10:00am. If all goes well, I should be able to get to work, though the ideal lighting is past, and finish a small work before heading back to Beloit. Not so fast. About thirty minutes later, a woman finally arrives in her car, talking on a cell phone (no jokes here), gets out of the car and gives me a hand gesture to let me know that she is on the phone and cannot interrupt her conversation. Interesting non-verbal communications between us as I pointed to my shirt (my name is on it) so that she could retrieve my information packet, got the canvases stamped, and received permission to use the shops bathroom all while not interrupting her conference call. Off to paint…finally. I decided to find something as quickly as possible. Found the flowers at a house along Main Street to be of interest. Shadows and colors were not working for me but I pressed on. By 1-ish, I decided to stop. Not sure if I should wipe this canvas clean for another attempt tomorrow or come back. Cleaned up, ate lunch out of the back of my car, made my way back to Beloit, retrieved my paintings, and back home. After unloading the car and getting a tall glass of ice water I reviewed the days work. I decided to work further on the painting on Tuesday morning. Better results ensued. Glad that Monday was past me.